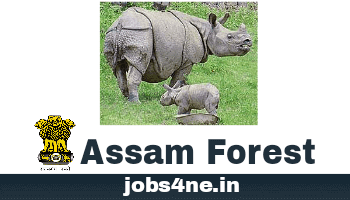 Assam Forest Recruitment for 90 Nos. Constable under Special Tiger Protection Force for KTR: Last Date 21-07-2017. - Jobs4NE : Jobs in Assam and North East India. Assam Forest Recruitment for 90 Nos. Constable under Special Tiger Protection Force for KTR: Last Date 21-07-2017. Only ONLINE applications are invited from eligible Indian candidates of permanent resident of the districts of Nagaon, Golaghat, Sonitpur, Biswanath and Karbi Anglong for the post of Constable under newly created Special Tiger Protection Force (Special Rhino Protection Force - SRPF) for Kaziranga Tiger Reserve (KTR), as per the guidelines issued by National Tiger Conservation Authority (NTCA), Govt. of India, New Delhi. Starting date of online application: 05-07-2017. Last date of online application: 21-07-2017. Job Location: Kaziranga National Park, Assam. Name of the post: Special Tiger Protection Force (Special Rhino Protection Force- SRPF) Constable for Kaziranga National Park. Total Nos. of post: 90 Nos. [Unreserved- 46, OBC/MOBC- 24, ST(P)- 9, ST(H)- 5, SC- 6]. Age Limit: 18 to 25 years as on 01-01-2017 (that is, the candidate must be born on or before 01.01.1999 and after 01.01.1992). Relaxation of upper age limit by, 5 years in respect of candidates belonging to SC, ST(P) and ST(H) candidates. Scale of pay: Pay Band-2; Rs.14,000- 49,000/- + Grade Pay Rs. 5,600/- + other allowances as admissible under the Rules. Place of Posting: To be deployed only in Kaziranga Tiger Reserve (KTR). Application fee: Rs.250/- for General Candidates, Rs.150/- for SC/ ST/ OBC/ MOBC candidates and NIL for BPL candidates (BPL Card holders only, Ration Cards not acceptable). The fee is to be paid online during form submission. How to Apply: Only online applications shall be acceptable, from 10.00 hrs on 5th July, 2017 through the Assam Forest website www.assamforest.in and shall be acceptable upto the midnight of 21st July, 2017. All online applicants will get an acknowledgment slip with an ID number which can be printed and will also get the information through SMS and e-mail. NO OFFLINE APPLICATIONS WOULD BE ACCEPTED. The recruitment process shall be conducted only at Bokakhat and Golaghat District. Helpline No. : 7086093238/ 7578941003/ 7578941004. For more details on this recruitment pls visit the official website: www.assamforest.in .